The risks of a bad hire can be significant. Yet still some business owners are willing to rely on “gut feel” in making hiring decisions. They fail to adequately conduct employment screening and background checks, lack necessary auditing protocol, and unwisely assume their employees have the company’s best interest at heart. An estimated 40% of all resumes contain inaccuracies or lies. As many as one-third of all business failures annually can be attributed to employee theft, according to the U.S. Department of Commerce. In the retail sector, where 2008 losses from theft were $36.5 billion, employees accounted for a whopping 40-45% of that amount. Consider that when an employee causes physical, psychological, or financial harm to people or property the employer is responsible for such behavior — in some cases, this is true even if the behavior occurs away from work. This unsettling reality, along with recent increases in negligent hiring lawsuits, rising recruitment and training costs, and escalating workplace violence and employee theft have led an increasing number of companies to construct background screening programs. Employment screening and background checks serve an important role in demonstrating reasonable care in the hiring process, which is critical to managing employer risk and reducing the possibility of a catastrophic event. Employment screening promotes a safer, more secure work environment for customers and employees since employers are able to make informed hiring decisions. Employment screening helps to deter undesirable candidates, leading to a higher quality candidate pool. Screening lowers the risk of negligent hiring lawsuits by helping to demonstrate an employer’s due diligence in the hiring process. 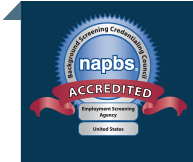 Employment background screening helps employers verify the accuracy of the information a candidate supplies, thus ensuring candidates have the necessary credentials for the job and ensuring workforce quality. Employment screening serves to meet local, state, and/or federal regulations for certain industries or jobs. It’s also used to meet contractual obligations related to screening. Background checks help to reduce employee theft and shrinkage by assessing an applicant’s past behavior and character. A background screening program that includes drug testing helps companies build a drug free workplace, thereby reducing the numerous negative impacts of employee substance abuse. When an employee causes catastrophic harm to people or property your brand can suffer irreparable harm. Often overlooked, background screening offers great protection to brand equity and corporate reputation. Companies have unique needs and objectives that can be served by a professionally-designed employment screening program. Proforma’s employment screening services are customized to your needs, addressing the risk tolerance and business objectives of your organization. To get started, give us a call at 866-276-6161 or request a meeting online.